Ever wondered whether Corn Flakes contain more sugar than Weeties? Or which yoghurt has the least sugar? Or which muesli bar is best to feed to the Kids? The Membership Site is dedicated to answering questions like that. But we don’t stop there. We also dig into alternatives to eating sugar, publish an ever-expanding range of sugar free recipes and get to the bottom of the current research on sugar and sugar alternatives. We also maintain constantly updated (and free) channels of current news about Sugar, Real Food(including Recipes) and Toxic Oils. 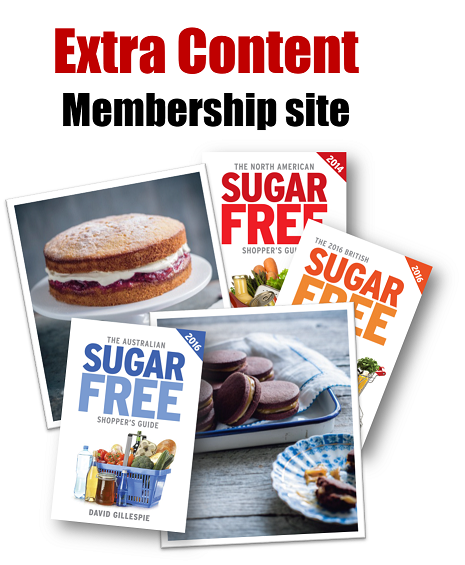 Membership of the site also includes free access to the Sugar Free Shopper’s Guides and great member’s only deals on David’s books (usually at least 25% off) which are offered regularly. A one year all inclusive membership is just $32.95 or you can sign up for two years for the discounted price of $49.95.